Incoming: The Earth-Moon system has company tonight. The Asteroid: Near Earth Asteroid 2010 WC9 is back. Discovered by the Catalina Sky Survey outside Tucson, Arizona on November 30th, 2010, this asteroid was lost after a brief 10 day observation window and was not recovered until just earlier this month. About 71 meters in size, 2010 WC9 is one of the largest asteroids to pass us closer than the Earth-Moon distance. 2010 WC9 poses no threat to the Earth. About the size of the Statue of Liberty from the ground level to her crown, the asteroid is over three times bigger than the one that exploded over Chelyabinsk, Russia on the morning of February 15th, 2013. The Pass: 2010 WC9 passes just 0.5 times the Earth-Moon distance (126,500 miles or 203,500 kilometers) on Tuesday, May 15th at 22:05 UT/6:05 PM EDT. That’s only roughly five times the distance of satellites in geosynchronous orbit. The asteroid is also a relative fast mover, whizzing by at over 12 kilometers per second. An Apollo-type asteroid, 2010 WC9 orbits the Sun once every 409 days, ranging from a perihelion of 0.78 astronomical units (AU) outside the orbit of Venus out to 1.38 AU, just inside the orbit of Mars. This is the closest passage of the asteroid by the Earth for this century. The passage of asteroid 2010 WC9 through the constellation Ophiuchus on May 15th from 00:00 to 16:00 UT. Credit Starry Night. Observing: This one grabbed our attention when it cropped up on the Space Weather page for close asteroid passes this past weekend: a large, fast mover passing close to the Earth is a true rarity. At closest approach, 2010 WC9 will be moving at 0.22 degrees (that’s 13 arcminutes, about half the span of a Full Moon) per minute through the constellation Pavo the Peacock shining at magnitude +10, making it a good telescopic object for observers based in South Africa as it heads over the South Pole. The southern hemisphere passage of asteroid 2010 WC9 on May 15th from 19:00 to 23:00 UT. North American and European observers get their best look at the asteroid tonight into early tomorrow morning while it’s still twice the distance of the Moon, shining at 13th magnitude and moving southward through the constellation Ophiuchus and across the ecliptic plane. The best strategy to ambush the space rock is to simply aim a low power field of view at the right coordinates at the right time (see below), and watch. You should be able to see the asteroid moving slowly against the starry background, in real time. Asteroid 2010 WC9 (non-streaking dot in the center) on May 15th while it was still 730,000 km out. Credit: Gianluca Masi/Virtual Telescope Project 2.0. Keep in mind, the charts we made here are geocentric, assuming you’re observing from the center of the Earth. Parallax comes into play on a close asteroid pass, and the Earth’s gravity will deflect 2010 WC9’s orbit considerably. Your best bet for generating a refined track for the asteroid is to use NASA JPL’s Horizons web interface to generate Right Ascension/Declination coordinates for the 2010 WC9 for your location. How do you ‘lose an asteroid?” Often, an initial observation arc for a distant asteroid is too short to pin down a refined orbit. We have a blind spot sunward, for example, and fast moving asteroids can also be difficult to track across rich star fields and movement from one celestial hemisphere to the next. Recovery of 2010 WC9 earlier this month now gives us a solid seven year observation arc to peg its orbit down to a high accuracy. Clouded out, or live in the wrong hemisphere? Slooh will carry an observing session for 2010 WC9 starting tonight at 24:00 UT/ 8:00 PM EDT. The Northholt Branch Observatories in London, England will also stream the pass live via Facebook tonight. Check their page for a start time. Go, little asteroid… the speedy passage of 2010 WC9. Credit: Northolt Branch Observatories. There’s no word yet if Arecibo radar plans to ping 2010 WC9 over the coming days, but if they do, so expect to see an animation soon. Don’t miss tonight’s passage of 2010 WC9 near the Earth, either in person or online. BREAKING- No sooner than the cyber-ink was dry on this post than we got notice of another 10-metre NEO asteroid 2014 EC passing Earth at just under 0.2 times the Earth-Moon distance – less than 64,000 kilometres – on Thursday, March 6th at 21:18 UT/4:18 PM EST. And the Virtual Telescope will be carrying this passage live as well on March 6th starting at 19:00 UT/2:00 PM EST. Bring in on, universe! The Earth-Moon system gets a close shave on the night of Wednesday, March 5th 2014 when Near Earth Object (NEO) asteroid 2014 DX110 passes our fair planet at 216,000 miles or about 345,600 distant at around 21:06 Universal Time (UT)/ 4:06 PM EST. About 30 metres in diameter, 2014 DX110 was discovered by the Pan-STARRS 1 survey on February 28th, and its orbit was initially refined using follow up observations made by the Great Shefford Observatory in West Berkshire, England. And although the asteroid is no threat to Earth or the Moon – it makes a pass 232,800 miles from our natural satellite one hour and 22 minutes after its closest passage from the Earth – the asteroid is currently listed on NASA’s risk page for a 1 in 10,000,000 chance of impact with Earth on March 4th, 2046. Of course, additional observations usually lower this remote possibility even further in the case of most newly discovered near Earth asteroids. Visually, 2014 DX110 isn’t expected to brighten above +15th magnitude as it glides northward through the constellation of Camelopardalis at closest approach Wednesday night. The webcast of the event is expected to go live at 20:30 UT, and will include live commentary. Its been a busy last few weeks in terms of asteroid flybys, including a passage of Amor NEO asteroid 2014 DU110 earlier today at 15:54 UT/10:54 AM EST at 0.14 A.U.s or just over 20 million kilometres distant. And the folks at the Virtual Telescope Project will be covering another asteroid flyby on Sunday, March 9th starting at 23:00 UT/6:00 PM EST to track the 180 meter asteroid 2014 CU13. This large Apollo NEO is projected to pass 8 lunar distances or over 3 million kilometres away from the Earth on March 11th at 9:05 UT/4:05 AM EST. It should be easy to pick out the motion of 2014 DX110 moving against the starry background at closest approach in real time. 2014 DX110 is an Apollo-class asteroid, and has an orbital period of 1192 days or about 3.26 years. It also has a fairly shallow inclined orbit relative to the ecliptic traced out by Earth’s path around the Sun, with a tilt of just over 5.7 degrees. This means that 2014 DX110 is approaching the Earth from just southward and behind it in its orbit around the Sun before crossing just inside of our orbit and northward of the ecliptic plane. The discovery of asteroid 2014 DX110 was announced by the Minor Planet Center on Sunday, March 2nd in electronic circular 2014-E22. The orbit of 2014 DX110 takes it just interior of Earth’s at a perihelion of 0.83 A.U.s from the Sun and out to an aphelion of 3.6 A.U.s into the realm of the asteroid belt between Mars and Jupiter. Generally speaking, asteroids passing interior to the Moon’s orbit grab our attention for further scrutiny. 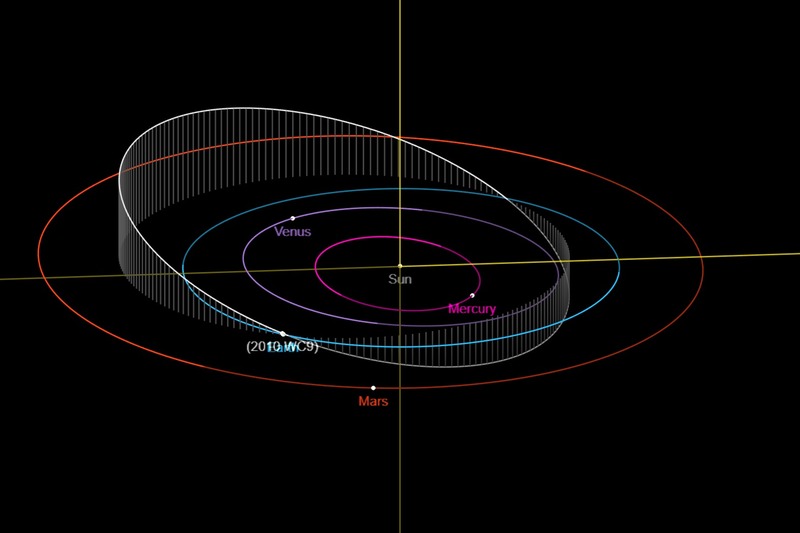 Looking back through the European Space Agency’s Near-Earth Objects Dynamics Site, asteroid 2014 DX110 also made an undocumented close passage of Earth on March 17th, 1998 at a minimum possible miss distance of 102,300 miles/163,680 kilometres distant, and a similar passage March 22nd, 1982. 2014 DX110 passed sufficiently close enough to Earth on these passages to alter its orbit so that it now returns to our terrestrial neighborhood every 13 odd years during the span of the 21st century. 2014 DX110 will be moving at a velocity of 14.8 kilometres per second relative to Earth on closest approach Wednesday night and will be inside the Earth’s Hill sphere of gravitational influence from March 4th to March 7th, though of course, it’s moving much too fast for capture. 2014 DX110 will be interior of the Moon’s orbit from 18:06 UT/1:06 PM EST on March 5th until 00:07 UT March 6th (7:07 PM EST on the night of March 5th). The large size – about the size of an office block – and the nature of its orbit, coupled with its relatively large velocity relative to the Earth rule out any potential for 2014 DX110 being space junk in solar orbit returning to Earth’s vicinity, though such objects from the Apollo missions and the Chinese Chang’e-2 Moon mission have been recovered as Earth asteroids before. Such an impact risk, however remote, merits further study to refine the orbit of this potentially hazardous space rock. Surveys such as PanSTARRS, the Catalina Sky Survey and the B612 Foundation’s asteroid hunting Sentinel space telescope slated for launch as early as 2017 are working to identify dangerous space rocks. The next and more difficult step will be mitigation and working to nudge these asteroids out of harm’s way, hopefully years in advance. But you can breathe a sigh of relief Wednesday night as asteroid 2014 DX110 passes us at a safe distance. Thanks to Gianluca Masi at the Virtual Telescope Project for bringing this one to our attention!